After taking many years off, UMD and Notre Dame have become familiar foes on the ice. The previous two years the teams have played non-conference series early in the season. Three seasons ago, the teams met in the Frozen Four in Saint Paul. going with a 4-0-0 record and a #2 record. UMD is a young team that may, or may not, be catching fire offensively paired with a head turningly strong defense. Something has to give. This weekend pits the top two defenses in goals against. Notre Dame has the edge with the help of two shutouts, both against NCHC’s Western Michigan. New Faces. Minnesota Duluth is playing the inaugural season of the NCHC while the Irish move from the now defunct CCHA to Hockey East. Catch them while they are here! UMD has no home games in November while going on the road for six straight games after this weekend’s series with Notre Dame. 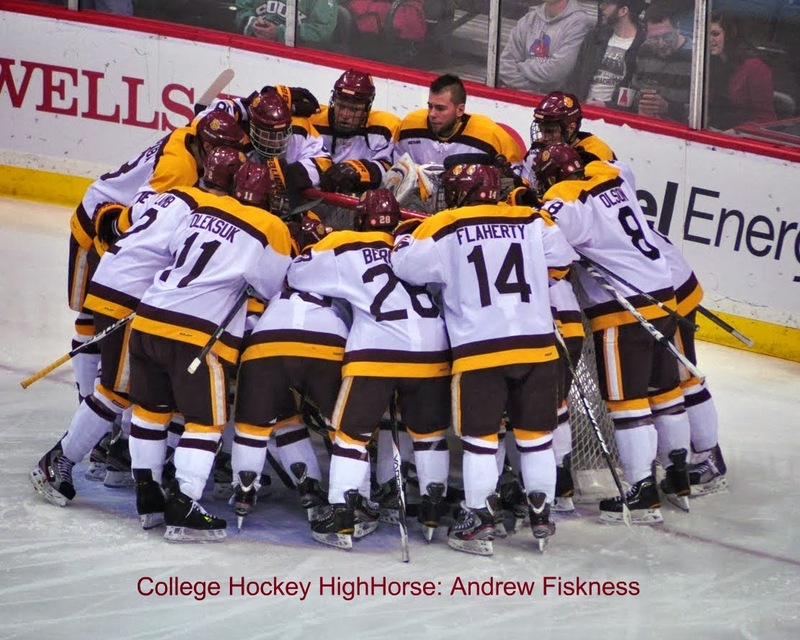 Next home series will have Saint Cloud traveling to Duluth for the first home conference series in the NCHC. Score Four. The Bulldogs are an impressive 30-0-4 in games they have scored four or more goals in since October 15, 2011. The last loss was 5-4 to Minnesota Twin Cities at Duluth. Picks by @afiskness. Last weekend there was two NCHC series and both ended in a split. This week there are no conference games. The six NCHC teams that play this weekend are all non-conference games. Currently Colorado College, Miami, Minnesota Duluth and North Dakota are tied for first in the conference with three points. Colorado College @ Clarkson: The Tigers travel to Potsdam, NY to take on the Golden Knights who only have one loss on the season so far. The Tigers should be able to find some scoring and earn a split. Saint Cloud State @ Colgate: This could be two good games. The Raiders have won low scoring games and gotten blown out in their losses. The Huskies have only played two games, but looked decent in those against the Beavers of Bemidji. The Huskies will get one win in Hamilton, NY and earn a split. Miami @ Providence: The Friars are sporting a perfect record hosting the Redhawks who have shown they can score goals again this year. I will go with a split. 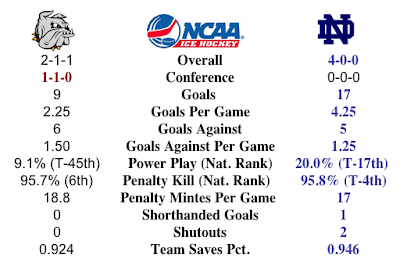 Notre Dame @ Minnesota Duluth: The Fighting Irish have a perfect record coming into this series. I liked the way the Bulldog defense has played this year and should be able to get a split at home. Cornell @ Nebraska Omaha: The Big Red make their 2013 NCAA debut against the Mavericks so I do not know exactly what to expect. But since they still have Andy Iles they should have good goal tending. I will go with a split. Niagara @ Denver & Canisius @ Denver: The Pioneers at home will be too much against both the Purple Eagles and the Golden Griffins. Denver with two wins.